Freddy Gray made eye contact with a Baltimore cop. He ran like a rabbit so cops chased him like hounds and did what hounds do when they catch a rabbit. They snapped his spine. But the elemental savagery of everyday policing in Baltimore and a hundred other cities is not a fit topic for presidential commentary. 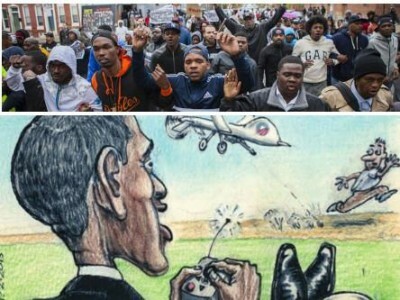 The only “criminals” and “thugs” the first black president and for that matter corporate news can see are the citizens in the streets protesting police murder and impunity. According to the Baltimore Police Department’s own story, all Freddie Gray ever did was make eye contact with a police lieutenant and take off running. In 21st century America, the relation of young black men to the police is such that when you run like a rabbit, cops will chase you like hounds. When the hounds caught 25 year old Freddy Gray they did what hounds do when they catch a rabbit. Baltimore cops snapped Freddy Gray’s spine, and they may have inflicted additional torture upon him during a half hour in leg irons in back of a police van after which they finally got around to calling the paramedics. This kind of simple, elemental savagery is the ordinary everyday state of policing not just in Baltimore but in a hundred other US cities. Black Baltimore knows, just like black Chicago, black Los Angeles and Philly and Birmingham and Jacksonville and Detroit — they all know that the courts and ballot box provide no credible remedies to the scourge of police violence or the national policy of mass incarceration inflicted upon Americans of African descent. Our black political class was quick to point to the absence of black faces in high places in Ferguson Missouri. But most Baltimore mayors have been black for a generation, as have many of its top cops. There are black faces in judges’ chambers, a mostly black city council and Maryland has a large and active legislative black caucus. Curbing the cops though, is not part of what any of our black political class actually DO. President Obama is big on poor people remaining peaceful and nonviolent and respecting the law. This is a notion that should either make us laugh out loud, or cry, it’s hard to decide which. President Obama you see, also claims the law entitles him to drone-bomb hundreds, perhaps thousands of civilians across Asia and Africa whose names he doesn’t even know based upon their “profiles” or their proximity to supposed “terrorists,” also frequently unknown by name. The president, along with his outgoing and incoming attorneys general assure us this is all perfectly legal. We have to take their word for it, because they’ve made the precise legal language of the rule they says permits this classified – a secret. Along with the president, Baltimore mayor Stephanie Rawlings-Blake also drew the line at protesters interfering with the private property of others. This too is a joke. The Baltimore PD is one of hundreds of cop shops that routinely confiscate cash and assets with little or no justification from people for its own use, a runaway policy called asset forfeiture blessed by the incoming attorney general Loretta Lynch. So let’s be clear – when presidents and mayors call for “nonviolence” and “obeying the law” and “respect for private property” they’re appealing to rules they would not dream of following themselves. These are the rules the police and prison state makes for its victims, the rules that hounds make for rabbits. If we no longer intend to be hunted by hounds, we have to start by ignoring their rules, as many of our finest young people are seizing the opportunity to do. The most important lesson of Freddy Gray’s death may be that it’s high time to stop running like rabbits. For Black Agenda Radio I’m Bruce Dixon. Find us on the web at www.blackagendareport.com. Bruce A. Dixon is managing editor at Black Agenda Report and a member of the state committee of the GA Green Party. He can be reached at bruce.dixon(at)blackagendareport.com.